Last week in a press conference which was attended by Dr. Hany Helal, minister of Higher Education and Scientific Research, and Mario De Martsinum, the Italian Consul in Cairo, it was announced that the joint Egyptian Italian team discovered a meteor crater in the south west of the western desert of Egypt, 2 km from Sudan boarders and 120 km from Libya . The story goes back to 2009 during a Google Earth survey of the western desert in co-operation between the Egyptian and Italian governments. The survey team spotted the 46 meters wide and 16 meters deep crater. It was given the name Kamil crater as it is near Kamil Mountain. 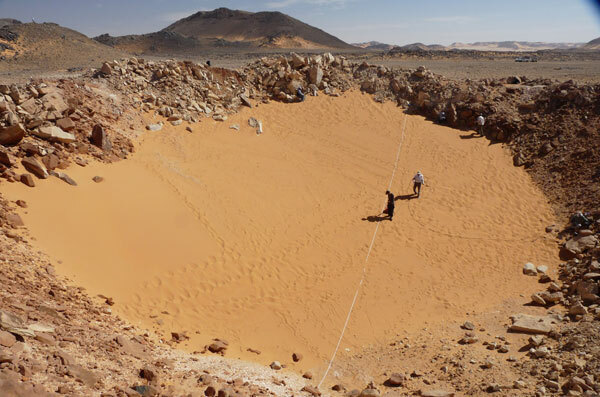 The crater rises above its desert surroundings and during visits to the site over the past two years researchers have collected around 5,000 iron meteorites (about 800 kilograms). They estimate that the original meteorite weighed between 5 and 10 tons and smacked the site at 12,000 kilometres per hour, giving the crater its characteristics, including “rays” that are visible in satellite photos. These rays, which emanate from the impact site like spokes from the hub of a wheel, are what drew researchers’ attention to the crater. While such “rayed craters” are common on the moon and other airless bodies of the solar system, they are exceedingly rare on Earth because erosion and other geological processes quickly erase such evidence. Researchers estimate that the site is relatively young, only about 5,000 years old. According to Dr. Maged El Sherbiny (Head of the Scientific Research Academy) that meteor will be studied by atomic force microscopy at Cairo University in the process of looking for Nano- bacteria.